This sheet music is intended for mixed voices or equal voices. It’s meant to be performed with rhythmic speech. When the birds sing, it’s not only for ornithologists. Richness and diversity of these sounds are a fundamental material for Mirtha Pozzi. 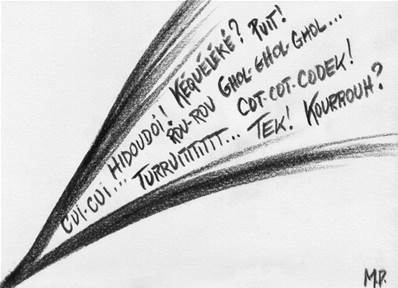 She’s attracted by “le grand pouvoir de seduction de l’onomatopée” (the great power of onomatopoeia). Orlando de Rudder’s “Ces mots qui font du bruit” deals with this topic. The whole choir performs the piece with rhythmic speech composed of birds’ onomatopoeias. But it’s not about imitating them, nor making a list of their sounds. Mirtha Pozzi wrote in a colorful tone with unusual vowels, vibrating consonants, doublings, and up or down glissandos in order to create dialogues, exchanges or unison. You can also introduce two freestyle parts, but their place and their contents are precisely mentioned. Singers who search for improvisation would easily find new onomatopoeias combinations based on the onomatopoeias used during the piece. An energetic, animated and happy music is expected.